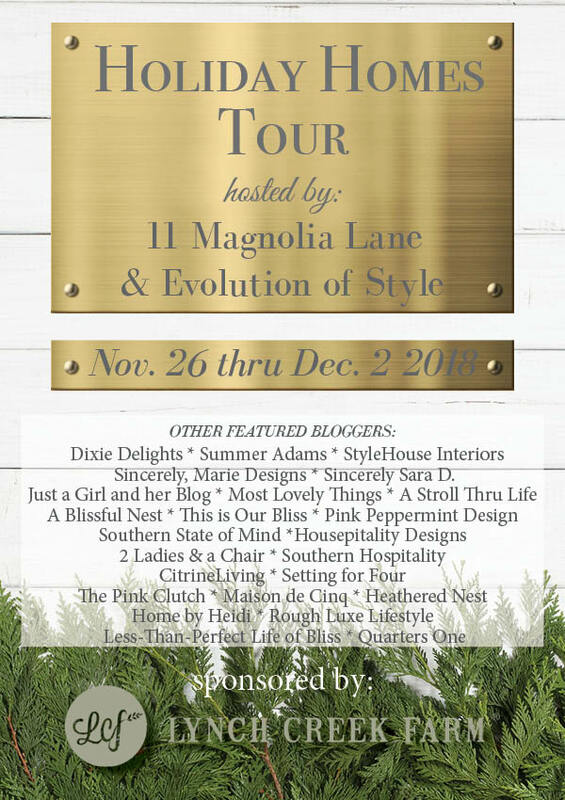 Welcome to the “12 Days Of Holiday Homes” hosted by my friends 11 Magnolia Lane & Evolution Of Style! We are so glad you’re participating in our tour, as we share our holiday homes with you. A huge “thank you” if you’re new here and coming from Dixie Delights. 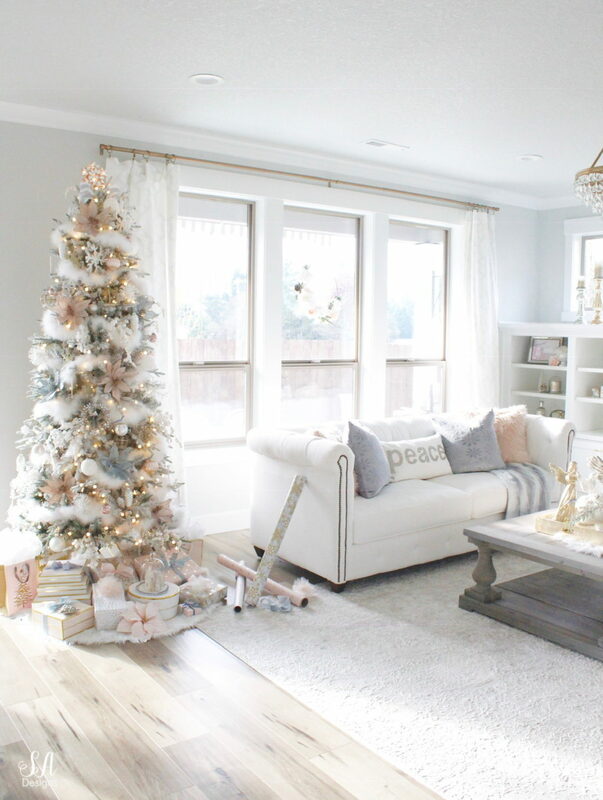 I am excited to share with you today my Whimsical Glam Christmas Living Room In Pastels. First, did you see my first Christmas tree and entry decorated in mixed metals? Make sure to stop by that first tour if you haven’t already. 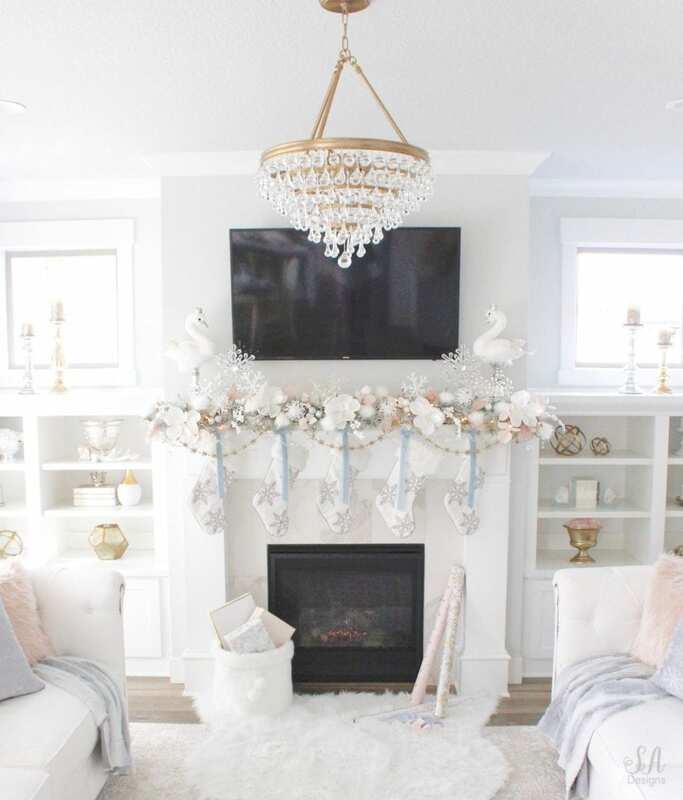 Moving into the living room, last week I shared our whimsical glam mantel to give you a little taste of the theme in here. 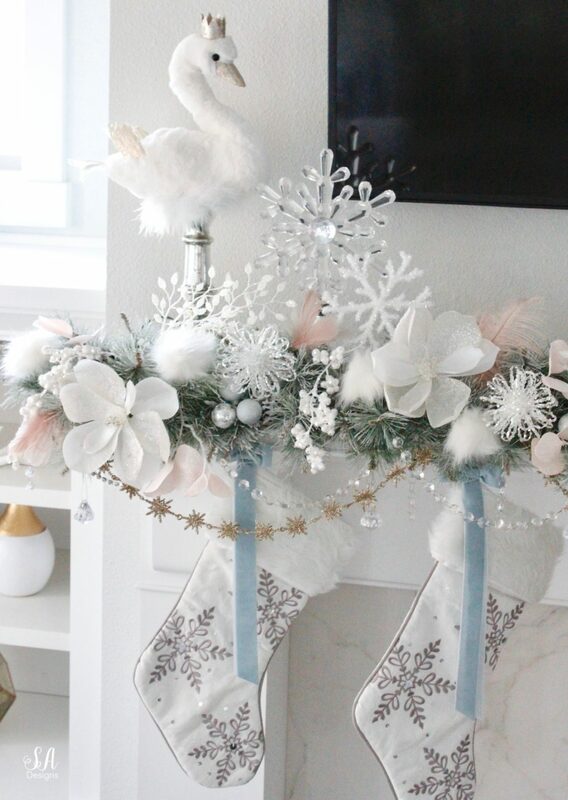 With the new Nutcracker Movie being released this year, and having 2 young children who still love the magic of Christmas, I was inspired to bring some fun “creatures” into our living room and bring a touch of whimsy. These crowned swans were just the thing I had imagined! I also shared our cozy glam hot cocoa bar station on the other side of the living room. Adding one of my favorite deer heads that I’ve had for several years, and glamming her up a bit, was another perfect touch of whimsy. Tree #2! Last year the tree in here was touching the ceiling and 1 1/2 feet wider and very full but it just swallowed this room. This year I wanted a slimmer tree so that I wouldn’t have to move the furniture around. 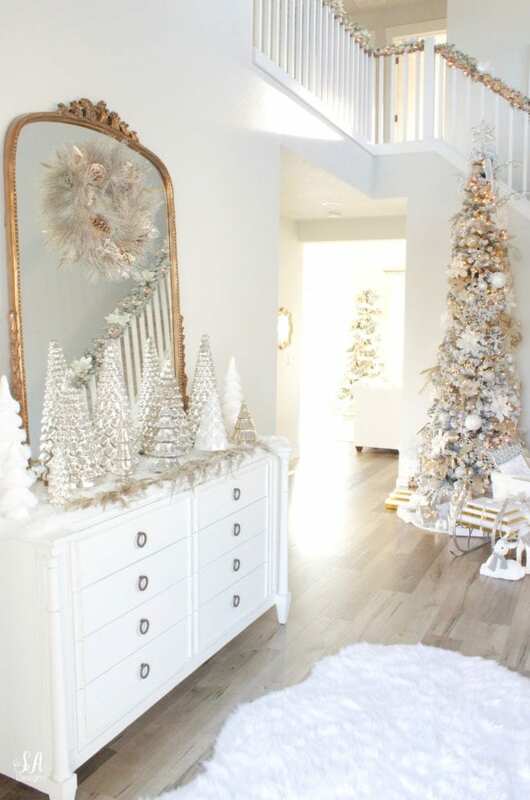 I also wanted a tree that was less full so that more light could pass through and also be able to tuck these soft maribou feather boas into it to look like soft fallen snow. I took each boa, folded it over and “doubled up” to make them look fuller and just tucked them in and out of the branches as if snow had just fallen there. I think I used 9 total! I also have a pretty little tutorial on that middle ornament. Hobby Lobby had all these pretty dusty blue and blush pink poinsettia stems this year and I was so thrilled! 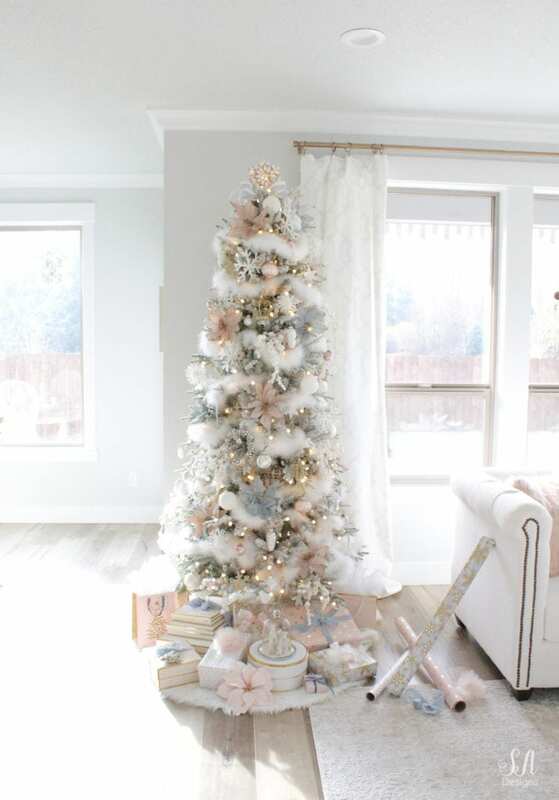 I grabbed all of my sparkly white stems and ornaments to cover the tree and then just added small touches of the blue and blush. All of my gifts always coordinate with my tree. I’ve found such pretty wrapping papers and gift bags at HomeGoods and Target again this year, and the gift boxes as well. I ordered pretty velvet ribbons from Etsy. 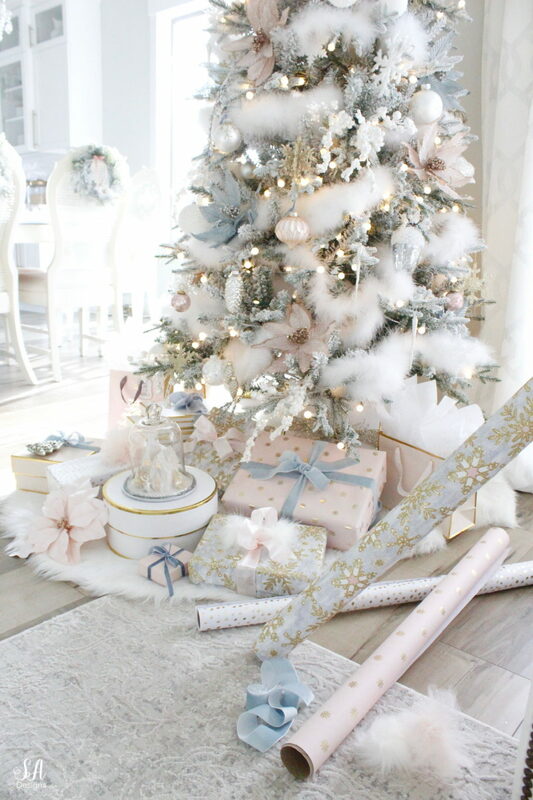 Tip: Don’t be afraid to add small Christmas decor items and stems around your gifts to create an even more beautiful look around your tree. I love the soft look of this tree as the sun shines through and gives that glow. 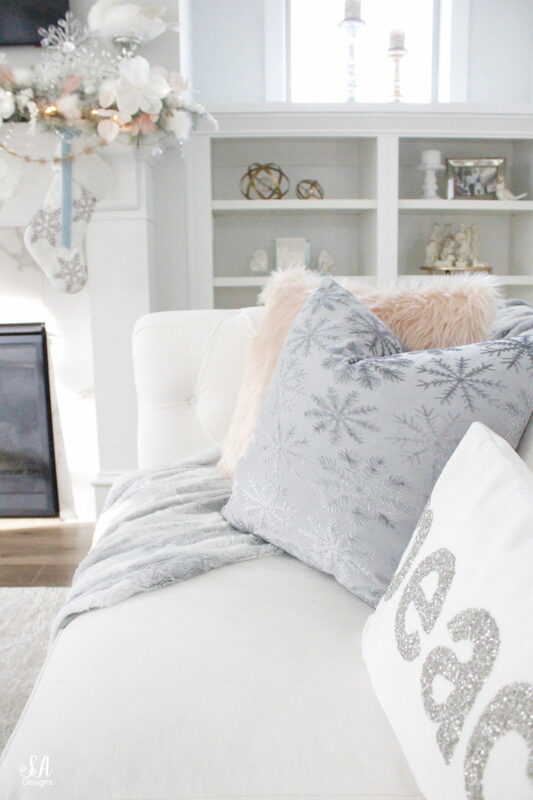 I spent hours online looking for dusty blue velvet throw pillows and after having no success, I walked into HomeGoods one day and found these pretty ones with snowflake motifs. 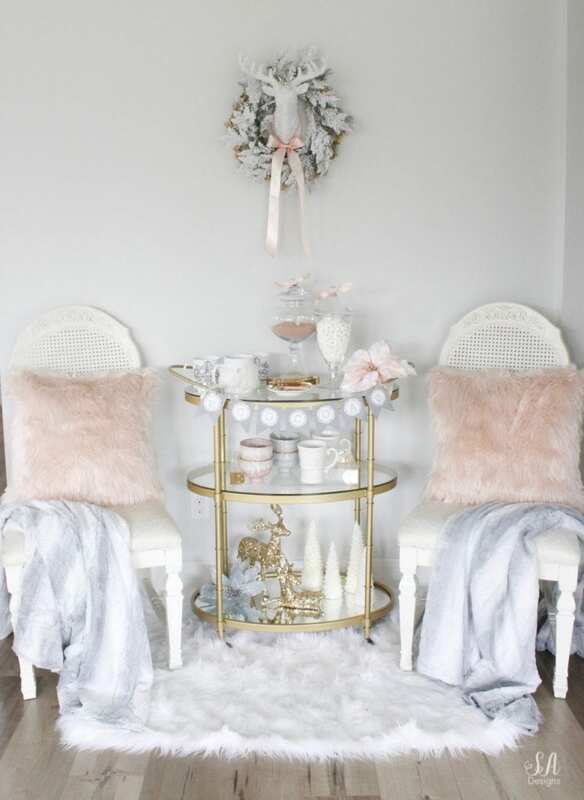 Also there were these blush pink faux fur throw pillows that were more on the peachy side and less on the mauve side, just as I wanted. 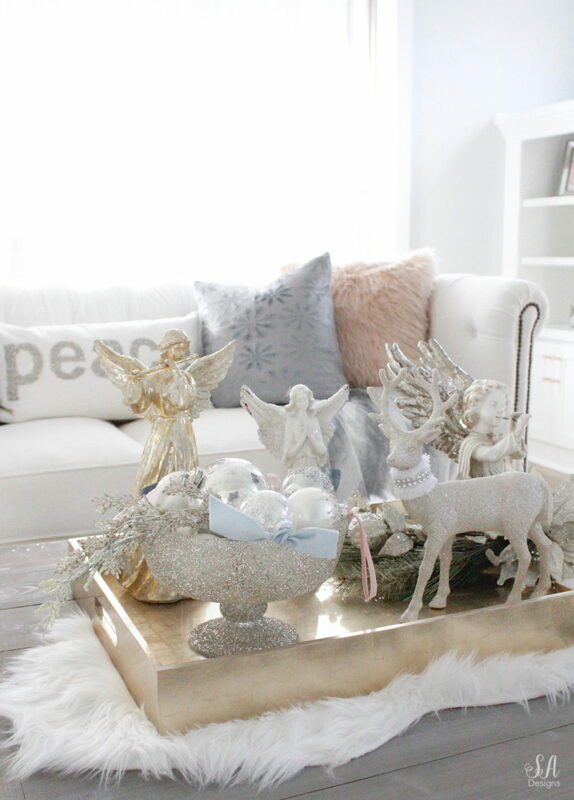 On my coffee table I placed some faux fur beneath my “angel tray”. This year I added all 3 of my angels to this pretty tray, along with one of my pretty deers and this bowl of ornaments. 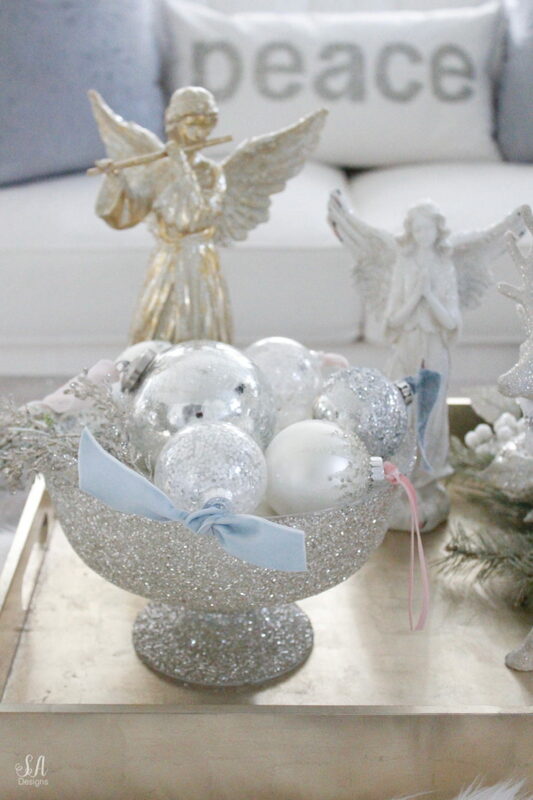 I usually place my ornaments in a different pedestal bowl but I found this sparkly bowl at ZGallerie this year and knew it would be perfect. You can use double-sided satin or velvet ribbon to tie on the ends for extra elegance. Stay tuned because tomorrow I’ll be sharing my whimsical kitchen with you and it will be a treat! Here’s a small teeny tiny peek. For your shopping convenience, I’m linking the items below from my post OR suggested/similar items to get the look. Click on the arrows to scroll right and left. 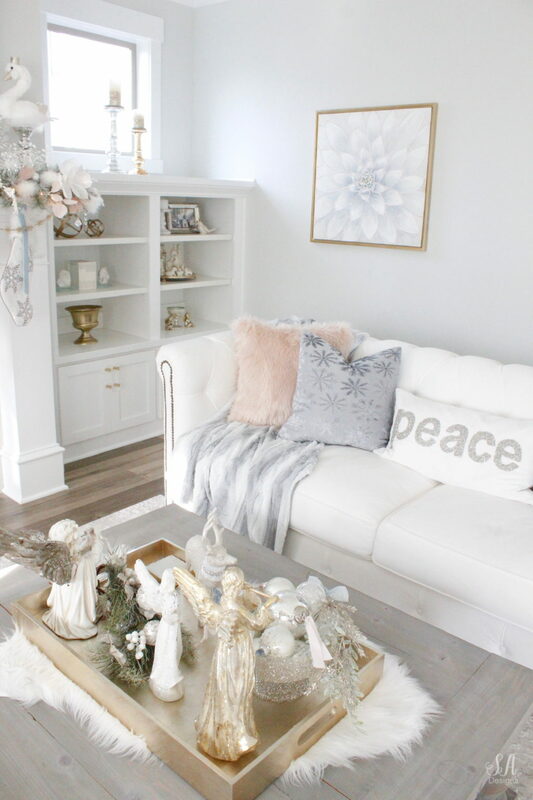 Next….please hop on over and visit my good friend Jen at Style House Interiors. Her home is just gorgeous! Don’t forget to check out the rest of these bloggers as the week progresses! It’s absolutely gorgeous, Summer! I honestly feel like I should stand up and applaud! That Anthro mirror is just stunning; I’ve been eyeing it for awhile. Thanks for joining us again on the tour–your house is always a highlight! I look forward to your tours every season, Summer! I’m living vicariously through you with all the pinks and sparkle. Everything is swoon worthy! I just adore every detail. Thank you so much for sharing your beautiful home with us, friend! 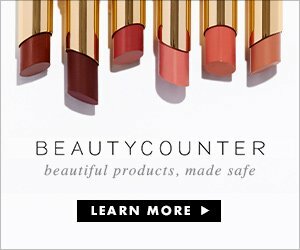 So beautiful, Summer, and so YOU! I love the color scheme you chose. Everything just screams elegance! It is fun being “on tour” with you this week, my friend! It’s so magical. I’m floored how gorgeous those boas look. About how many feet in all did you use? I’d love to try this with my mixed metals just to add some contrast. Thank you for sharing. Summer it all looks so magical! I love your gorgeous swans on the mantle! 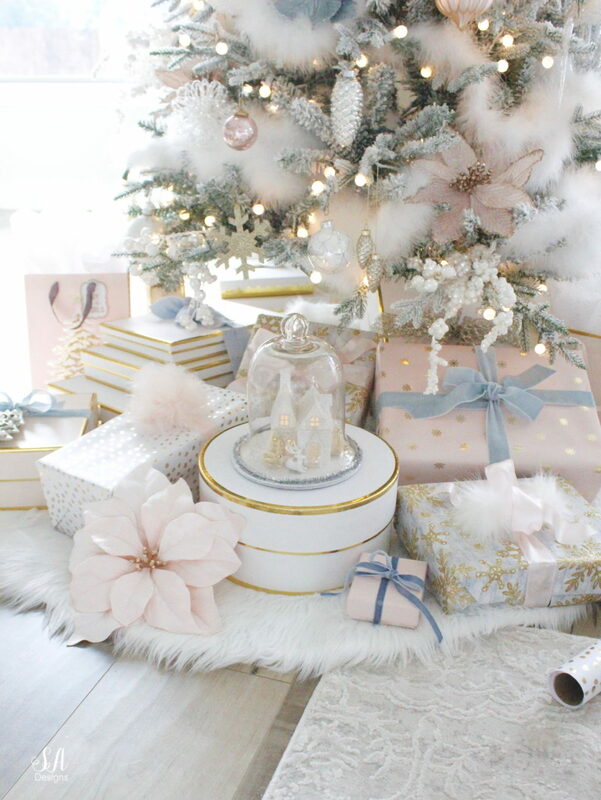 I adore your theme this Christmas! 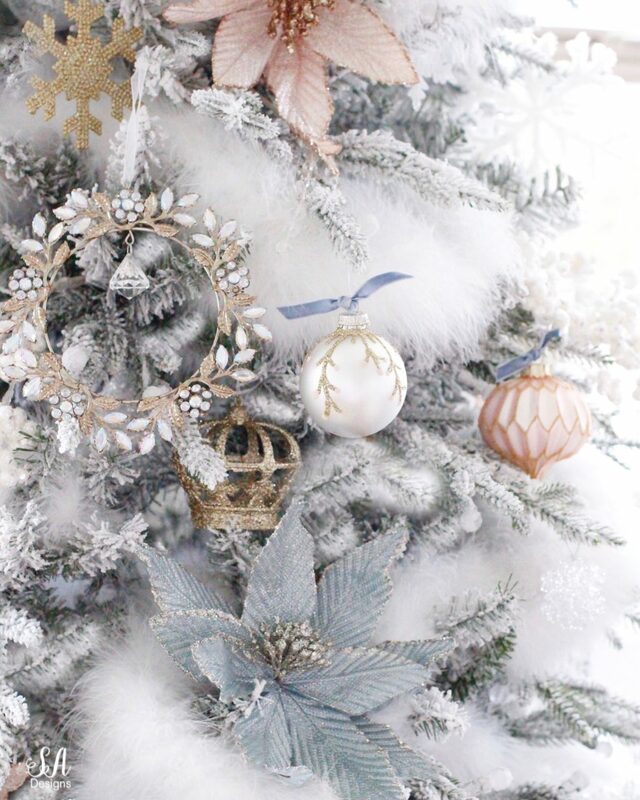 You’ve created a gorgeous magical winter wonderland!!! I wish you and your family a merry and blessed Christmas season! It looks like a snowy wonderland! It’s so soft and elegant. I agree with Jen…reminded me of the Nutcracker! Everything is just stunning. What a wonderful place to celebrate the holidays in! Blessings to your family in the coming year. 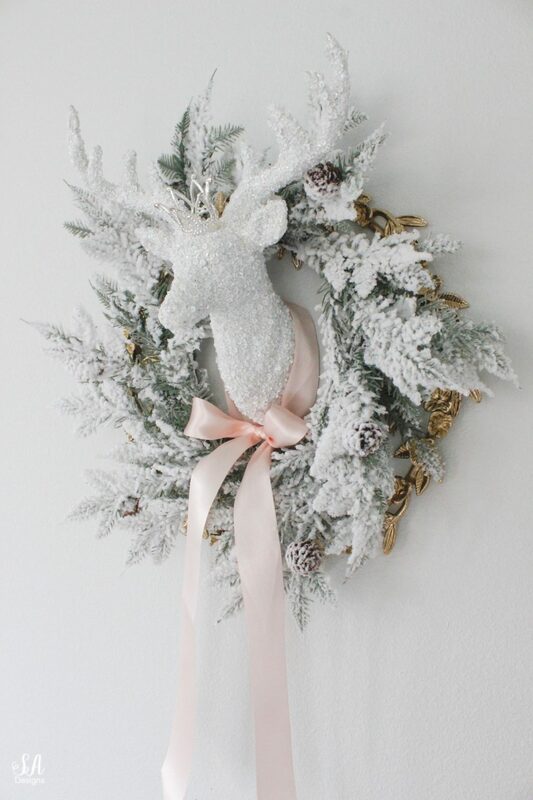 Your home is so feminine and pretty decked out for Christmas. Every little girls dream! 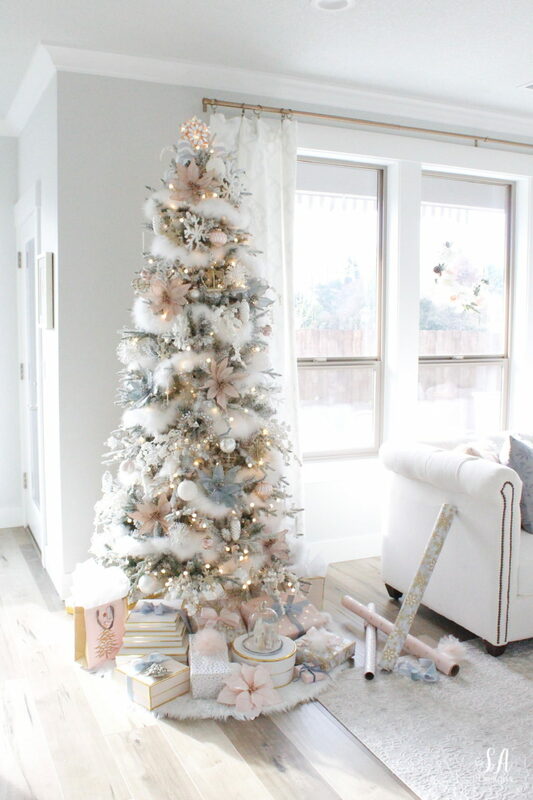 Ooh, I love that tree and the snowy feather boa! Everything looks just fabulous! So so beautiful! ALL of it! I love your pink satin ribbon and those fur pillows… it all looks so fresh and luxurious!